Draft: 2011, New York Mets, 34th rd. Jacob Seth Lugo graduated from Parkway (LA) High School...Lettered in baseball, soccer, football (punter) and track...He was a state finalist in the high-jump (6 feet, 2 inches)...Went to Centenary (LA) College when it was a Division 1 school... Earned Second Team All-Summit League Honors in 2010...Went 2-1 with a 4.20 ERA (seven earned runs/15.0 innings) in three starts for Puerto Rico during the 2017 World Baseball Classic...He started the Championship Game vs. the United States...His paternal grandfather was born in Puerto Rico. Was 2-2 with three saves and a 2.30 ERA (20 earned runs/78.1 innings) in 49 games in relief and 1-2 with a 3.91 ERA (10 earned runs/23.0 innings) in five starts (May 31-June 25)...For the second consecutive year pitched exactly 101.1 innings... Was second on the team with 11 holds...Was fifth in the NL and 12th in the majors with 78.1 relief innings... Finished second in the NL and seventh in the majors with 27 relief outings of more than 1.0 inning...Had a 1.52 ERA (nine earned runs/53.1 innings) at home, the third-lowest in the majors (min. 50.0 innings)...Only Hyun-Jin Ryu (1.15) and Blake Snell (1.27) had lower home marks...Tossed a career-high 17.0-consecutive scoreless innings with 19 strikeouts from May 1-25...Was the longest single-season scoreless streak by a Mets reliever since Jeurys Familia's 17.0 scoreless inning streak from June 8-July 19, 2016...Also had a 13.0-inning scoreless streak from May 31-June 10...Earned his first major league save on August 12 at Miami with 1.0 scoreless inning in a 4-3 win...Also earned a save on September 9 vs. Philadelphia and September 26 vs. Atlanta...Had three professional saves prior to the 2018 season, all with St. Lucie (A) of the Florida State League in 2014...According to StatCast, ranked second in the majors with an average spin rate of 3,173 rpm on his curveballs (min. 150 curveballs thrown)...Was 1-1 with three saves and a 1.64 ERA (seven earned runs/38.1 innings) vs. NL East teams...Held opponents to a .192 (15-78) batting average with RISP...Posted a 1.42 ERA (three earned runs/19.0 innings) over his final 13 contests (August 19-September 26)...Became the third pitcher in major league history with consecutive relief appearances of 2.0 innings or fewer with five or more strikeouts, September 9-13...Right-handers went 49-200 (.245) and lefties were 32-174 (.184). Missed the first nine weeks of the season after being placed on the 10-Day Disabled List on April 2 due to right elbow inflammation...After going on a rehabilitation assignment in St. Lucie (A) on May 18, he was transferred to the 60-Day DL on May 26...Went on another rehab assignment on May 27 in Binghamton (AA) and was activated from the 60-Day Disabled List on June 11, when he made his season debut at Atlanta...Tied a franchise record by winning six consecutive road starts from August 25, 2016-June 29, 2017...Tom Seaver and Jerry Koosman each did that twice...Seaver did so from September 20, 1968-May 21, 1969 and August 9-September 27, 1969 while Koosman did it from April 11-June 4, 1968 and September 11, 1972-April 29, 1973...Pitched 5.0 or more innings in each of his first 19 starts, the second-longest streak in team history...Matt Harvey began his career with 44 straight starts of at least 5.0 or more innings...Ended the year by matching his career-high scoreless streak, tossing 8.0 scoreless innings over his last three starts from September 19-30...Went 3-1 with a 1.80 ERA (three earned runs/15.0 innings)...In his final 14 games (13 starts), opposing hitters batted .241 (13-54) off his curveball...Also on the 10-Day Disabled List from August 15-27, with a right shoulder impingement...Returned and started the second game of a doubleheader on August 27 against the Nationals...Hit his first career home run with a solo shot in his July 15 start off of Colorado's Chris Rusin in the third inning at Citi Field... Was called on to pinch-hit for the first time in his career on August 9 at Texas...Went 2-1 with a 4.20 ERA (seven earned runs/15.0 innings) in three starts for Puerto Rico during the World Baseball Classic... He started the Championship Game vs. the United States. 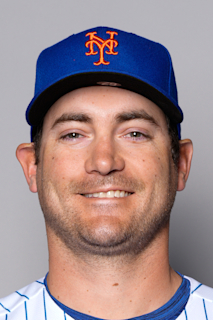 Was with the Mets from June 30-July 2, July 6-August 2 and August 12 through the end of the season...The Mets won each of the last seven games he started (August 25-September 28)...Went 5-0 with a 2.45 ERA (11 earned runs/40.1 innings)...In eight starts after joining the rotation, he went 5-1 with a 2.68 ERA (14 earned runs/47.0 innings)...Earned his first major league win in his second career start in the Mets' 10-6 victory against the Cardinals on August 25 at Busch Stadium...Tossed 5.0 scoreless innings and allowed two hits...Became the fourth Mets pitcher with four wins in his first five starts in the majors after his victory on September 11 at Atlanta...The other Mets pitchers with four wins in their first five major league starts were Terry Leach (4-0), Jason Jacome (4-1), and Steven Matz (4-0)...Struck out Miami's Xavier Scruggs swinging at a 1-2 curveball in the sixth inning on August 30...Statcast measured the curveball to Scruggs at 3,498 rpm (revolutions per minute), which was the highest spin on a curveball they have tracked since the system was put into place prior to the 2015 season....According to Statcast, he had 12 of the 13 highest spin curveballs during the 2016 season...Allowed two runs or less in six of his eight starts...Made nine relief appearances for the Mets when he was first called up before being moved into the rotation...Went 0-1 with a 2.65 ERA (five earned runs/17.0 innings) as a reliever...Held lefthanders to a .196 (20-102) batting average and righthanders to a .240 (29-121) mark with the Mets...With runners in scoring position, opponents hit .149 (7-47)...Was 3-4 with a 6.50 ERA (53 earned runs/73.1 innings) in 21 games (14 starts) with Las Vegas (AAA) of the Pacific Coast League. Spent the majority of the year with Binghamton (AA) of the Eastern League…Won a spot start for Las Vegas (AAA) of the Pacific Coast League at Salt Lake City on August 5…Allowed two earned runs and five hits in five innings…Struck out 12 batters in 6.2 innings at New Orleans on August 23…Went back to Binghamton for a start against Altoona and then rejoined Las Vegas for four more starts from August 18-September 3…Won four straight starts from July 7-July 26… In 25.0 innings, he allowed 14 hits, one earned run, (0.36 ERA) with eight walks and 26 strikeouts…Did not allow a run in two straight starts vs. New Britain on July 7 and at Portland on July 12 (11.0 innings)…Right handed batters hit .245 (58-237) against him at Binghamton. August 27, 2017 New York Mets activated RHP Seth Lugo from the 10-day injured list. August 15, 2017 New York Mets placed RHP Seth Lugo on the 10-day disabled list retroactive to August 12, 2017. Right shoulder impingement. June 11, 2017 New York Mets activated RHP Seth Lugo from the 60-day disabled list. May 27, 2017 New York Mets sent RHP Seth Lugo on a rehab assignment to Binghamton Rumble Ponies. May 26, 2017 New York Mets transferred RHP Seth Lugo from the 10-day disabled list to the 60-day disabled list. Right elbow inflammation. May 18, 2017 New York Mets sent RHP Seth Lugo on a rehab assignment to St. Lucie Mets. April 2, 2017 New York Mets placed RHP Seth Lugo on the 10-day disabled list retroactive to March 30, 2017. Right elbow inflammation. October 6, 2016 New York Mets activated RHP Seth Lugo. October 5, 2016 New York Mets reassigned RHP Seth Lugo to the minor leagues. August 12, 2016 New York Mets recalled RHP Seth Lugo from Las Vegas 51s. August 2, 2016 New York Mets optioned RHP Seth Lugo to Las Vegas 51s. July 6, 2016 New York Mets recalled Seth Lugo from Las Vegas 51s. July 2, 2016 New York Mets optioned RHP Seth Lugo to Las Vegas 51s. June 30, 2016 New York Mets recalled Seth Lugo from Las Vegas 51s. April 30, 2016 Las Vegas 51s activated RHP Seth Lugo from the 7-day disabled list. April 23, 2016 Las Vegas 51s placed RHP Seth Lugo on the 7-day disabled list. March 15, 2016 New York Mets optioned RHP Seth Lugo to Las Vegas 51s. November 20, 2015 New York Mets selected the contract of Seth Lugo from Las Vegas 51s. August 18, 2015 RHP Seth Lugo assigned to Las Vegas 51s from Binghamton Mets. August 6, 2015 RHP Seth Lugo assigned to Binghamton Mets from Las Vegas 51s. August 5, 2015 RHP Seth Lugo assigned to Las Vegas 51s from Binghamton Mets. April 2, 2015 RHP Seth Lugo assigned to Binghamton Mets from St. Lucie Mets. October 30, 2014 RHP Seth Lugo assigned to Indios de Mayaguez. October 30, 2014 Indios de Mayaguez placed RHP Seth Lugo on the reserve list. April 3, 2014 RHP Seth Lugo assigned to St. Lucie Mets from Savannah Sand Gnats. August 3, 2013 RHP Seth Lugo assigned to Savannah Sand Gnats from Brooklyn Cyclones. June 16, 2013 Seth Lugo assigned to Brooklyn Cyclones from Kingsport Mets. June 20, 2011 Seth Lugo assigned to Kingsport Mets. June 19, 2011 New York Mets signed RHP Seth Lugo.